Frank Edgar Evans born 19 November 1876 in Franklin, Pennsylvania, served as an infantryman in the Spanish-American War, and was commissioned in the United States Marine Corps on 15 February 1900. He served in the Philippines and in the United States prior to World War I, during which he won the Navy Cross and other awards for the distinction of his service in the Marine Brigade of the American Expeditionary Force in France. His postwar service included duty in Haiti, where from 1927 to 1930 he commanded the Constabulary Detachment and was Chief of the Gendarmerle d'Haiti. Brigadier General Evans also was District Marine Officer of several Naval Districts. Retired 1 December 1940, he made his home in Honolulu, Hawaii, where he died 25 November 1941. The destroyer USS Frank E. Evans (DD-754) was named in his honor. Adjutant, 6th Regiment (Marines), 2d Division, A.E.F. The Navy Cross is presented to Frank E. Evans, Lieutenant Colonel, U.S. Marine Corps, for exceptionally meritorious and distinguished service as Adjutant, 6th Regiment Marines, 2d Division, A.E.F. 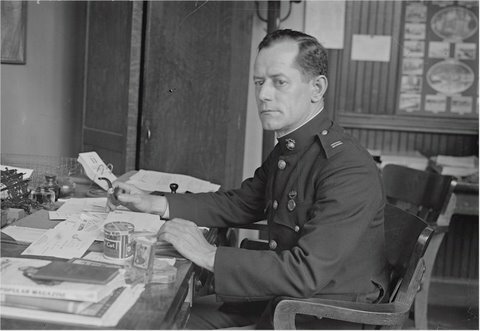 During the trying events of the early part of June 1918, while in action against the enemy at Belleau Wood, Lieutenant Colonel Evans carried the administrative burdens of his regiment with great efficiency. His untiring efforts, constant diligence, and intelligent transmission of orders from the Brigade Commander during a number of days when his Regimental Commander was in an advanced headquarters and not always in communication, contributed in no small degree to the successful part played by the 6th Regiment in the operations against the enemy from the 1st to the 16th of June, 1918.